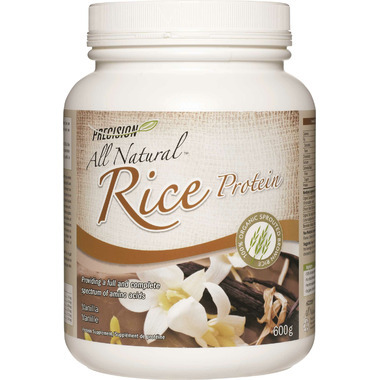 Precision All Natural™ Rice Protein features a low temperature processed, non-GMO, organic sprouted brown rice protein concentrate. Unlike proteins derived from white rice, sprouted brown rice is a complete protein and provides the full spectrum of amino acids which are essential for the maintenance of good health. 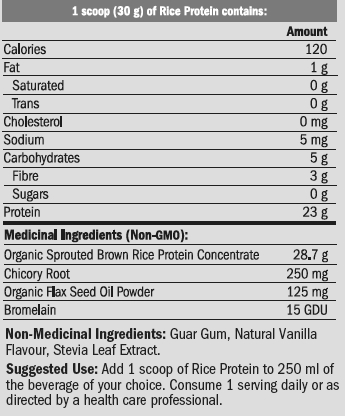 Sprouted brown rice protein is also gluten free, 100% vegan, and is often used by consumers wishing to avoid common food allergens such as dairy, wheat, corn and soy. Organic rice proteins are processed using natural enzymes and are free of solvents and pesticides. Purchased this after seeing the great reviews and can honestly say I am shocked. This is the worst tasting protein I have ever had and I could not even get through one glass. The texture is somehow like chalk even when completely dissolved and the taste is horrible. Would not recommend. I like using this as an ingredient in recipes like carrot cake or muffins but can't get over the texture to drink on its own. It has a nice sweetness. We add this to pancakes and muffins to add protein and it tastes wonderful! I use this for smoothies and love the taste. Perfect!